#206...finally, and with little merriment. A nice crisp morning at Woodland Park was a great reprieve from the chaos of work (although I'm sure in a week the chaos will be compounded). The place was much birder than it had been the past few days, and relatively early. Unbelievably I caught a view of the first White-crowned Sparrow seen here. Found it hard to believe that was the first. A plethora Cedar Waxwings were out in the Juniper trails, along with some Yellow-rumped Warblers and White-throated Sparrows. A few of the latter trying to practice their typical "Sam Peabody" song. Golden-crowned and Ruby-crowned Kinglets were also in some abundance out there. It was quite active within the first 15 minutes I was at around 20 species sighted. I moved back into the Hidden Loop trail hoping to catch the ever elusive Orange-crowned Warbler, or any other warbler that may desire to show itself. Back near the lower growth in the South-west corner (near where I am 60% sure the OCWA teased me) I came across a nearly impossible to see bird. It moved quickly, and deeply in the undergrowth. Too close for me to get binocular focus on it, yet to deep to get any auto focus to work on the camera. But there is apparently a little bird-mojo left in me. 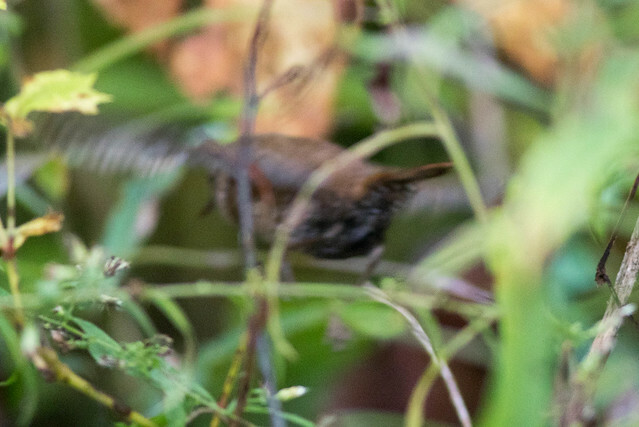 Looking back through my photos, and a little Lightroom auto-correction, I got enough of one very fuzzy focus shot (along with its behavior and size) to ID it as #206 for Calhoun County...Winter Wren. The mild jubilance I expected to experience in the field, was a bit muted with the confirmation of what the dark derriere proved. I'll take it and proceed to keep trying to bird the heck out of this county. There are plenty out there to still find, and learn to ID.